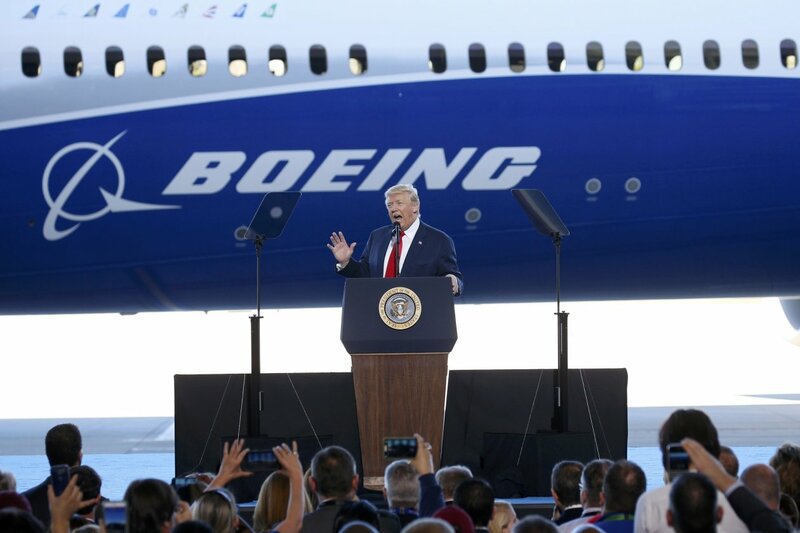 President Donald Trump spoke at a Boeing factory in North Charleston, South Carolina last year. Trans-Atlantic relations, already near a postwar low due to battles over Iran and tariffs, face new danger from a long-simmering fight over jetliners. The U.S. is expected within days to win a World Trade Organization ruling in its challenges to European Union support of plane maker Airbus SE through billions of dollars in subsidies. The EU has a separate case against the U.S. and Boeing Co. that trails the U.S. case by several months. For 14 years the two sides traded accusations and legal charges while the battle—the WTO’s largest ever—slipped from public view. The dispute could still drag on for years more. But next week’s largely procedural ruling now promises to thrust the dispute into the spotlight again because of unrelated fights between the U.S. and EU over President Donald Trump’s decision on Tuesday to withdraw the U.S. from the 2015 Iran nuclear deal and his threat to levy tariffs on EU exports of steel and aluminum. Penalties in the U.S. case against Airbus could potentially run in the billions of dollars annually. The U.S. Trade Representative and Boeing have argued that European countries pumped $22 billion in illegal subsidies into Airbus to help it develop and expand. The U.S. has argued that without that funding—mostly through preferential loans—Airbus wouldn’t have grown to rival Boeing. Airbus and the EU have argued that Boeing unfairly benefited from U.S. government funding from the Pentagon and NASA, plus state and local tax breaks. The ruling in the equivalent EU case will come later this year. The U.S. argues the EU subsidies to Airbus are far larger than anything Boeing received, an argument Europeans dispute. Coming amid so many disputes between the U.S. and EU, the WTO ruling could play in many ways. The lumbering litigation’s duration could provide ammunition to WTO critics in the Trump administration who call the organization unwieldy and slow. But a decision that runs against the EU could give Mr. Trump another cudgel with which to browbeat Europe on trade matters. Even before the tariff fight arose in March, U.S.-EU relations were deteriorating following Mr. Trump’s decision to withdraw from the Paris climate accord and his haranguing European governments to spend more on defense. During the presidential campaign in 2016, Mr. Trump supported Britain’s exit from the EU and applauded the Brexit vote, enraging many of his European counterparts. In March, Mr. Trump said the EU “has not treated us well. And it’s been a very, very unfair trade situation.” His criticisms have largely focused on German car exports. He hasn’t mentioned airplanes. Trans-Atlantic tensions worsened this month when Mr. Trump pulled the U.S. out of an accord with Iran that granted Tehran sanctions relief for restrictions on its nuclear program. European allies who are also signatories to the pact lobbied Washington not to exit from the agreement. Early in Mr. Trump’s presidency he attacked Boeing over the cost of building new Air Force One planes. The price was renegotiated and Mr. Trump has since been more supportive of the company, America’s largest exporter. Boeing, in turn, has endorsed many of Mr. Trump’s policies. It hosted a speech Mr. Trump gave at one of its jetliner factories. After Washington in December passed tax overhaul legislation that Mr. Trump championed, Boeing Chief Executive Dennis Muilenburg quickly voiced his support and announced investments he said were made possible by lower tax rates. Boeing responded at the time that it supports “strong competition, rules-based trade and a level playing field for all in the industry.” Both Boeing and Airbus declined to comment ahead of the WTO ruling. Boeing, which has large factories in Washington state, Missouri and South Carolina, enjoys broad support in Congress. Airbus has worked to offset that by opening assembly lines in Texas, Mississippi and Alabama, where it has built single-aisle airliners since 2015. The WTO ruling, which could come as soon as Monday, is expected to clear the way for the U.S. to impose several billion dollars annually in retaliation on European goods and services unless the EU takes steps to comply with the trade body’s ruling. The U.S. and Europe are expected to squabble over the size of the trade retaliation that can be imposed, which are linked to the harm subsidies to Airbus have done to Boeing rather than the scale of the state aid itself. The U.S. is likely to go after goods and services with high political impact, rather than items used in aerospace. Boeing and Airbus: two 1200-pounds pigs accusing each other to be a bit overweight. No company in the world would survive after making a disastrous bet like Airbus did with their A380. No airline in the world is ordering them other than Emirates and that too at a steep discount just to keep the factory going. They probably lost $10B+ by miscalculating the market needs whereas Boeing successfully developed 787 to meet the new trends. EU can argue using false equivalency that Boeing also gets subsidized but nothing close to what Airbus is used to get from EU and France/UK/Germany to retain the jobs. Hope the WTO ruling leads to positive changes with the admin actually doing something about trade unlike the past 20+ years of talk and more talk.